Early Monday morning, Sen. Elizabeth Warren (D-MA) became the first Democrat to announce she's forming an exploratory committee for the 2020 presidential election. President Trump offered his first response to the news in a phone interview with Fox News's Pete Hegseth just a few hours ahead of the new year. Hegseth asked Trump whether Warren really has a shot at the White House. "Well, that I don't know," Trump said. "You’d have to ask her psychiatrist." Later the two discussed Sen. Warren's ancestral scandal that has plagued her political career for quite some time. Years ago she reportedly used her "Native American" background to score a position on the Harvard University faculty. Last year she released the results of a DNA test to prove she was at least 1/1,024 Native American, resulting in more than a few jokes and outrage from groups who accused her of cultural misappropriation. Trump, who famously gave her the nickname, "Pocahontas," added to the mockery on Fox. "Elizabeth Warren will be the first," Trump told Hegseth. "She did very badly in proving that she was of Indian heritage. That didn't work out too well." Trump suggested he and Hegseth had more Native American blood. This isn't the first time the president has encouraged her to run. 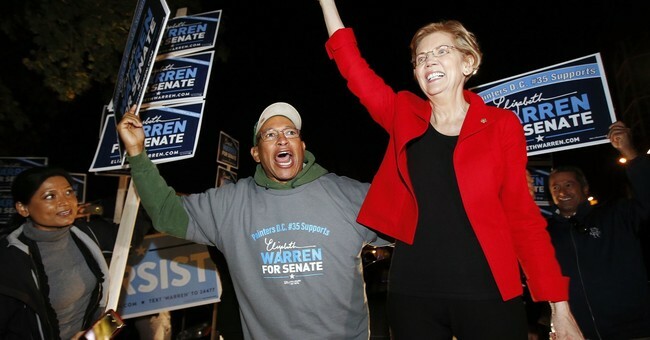 Sen. Warren is undoubtedly a popular progressive, but as media analysts and even the Boston Globe have noted, she is destined for defeat. However, she didn't seem fazed by the doubters, judging by her carefree, beer drinking Instagram video with her supporters last night reflecting on her big announcement.